It seems I never can stay within my border, no matter how strong I draw it. As if the border was just a warning “Attention! The tile ends in 4mm (or less)!” ^^; But I guess that this is part of my “style”? Well, decide for yourself. I’m very happy with this one, especially with the happy accidents I think nobody will notice anymore. I’m not sure that I can play regularly from now on, but at least this is a first step! 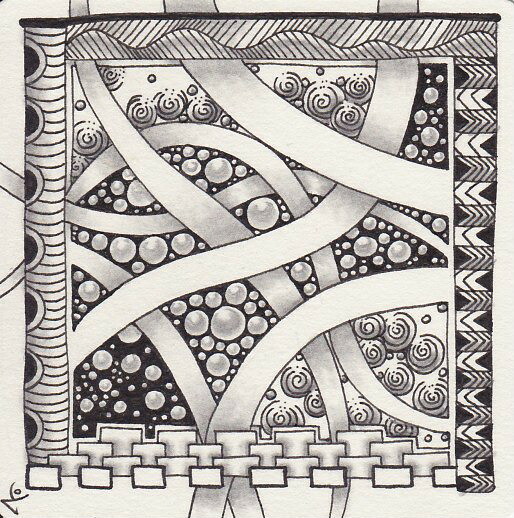 Oh my, it has been ages again since I posted something here… Especially if you are looking for anything on my “One Zentangle a Day”-project. But after a very busy Inktober and after I finished compiling and crafting an art supply Advent calendar for a fellow ATC artist on a German ATC website (I’ll show you some pictures of that after 1st December! ), I FINALLY found the time again to continue this project! I definitely will NOT be able to tangle or post a tile every day, but I’ll try to squeeze in two tiles per week. If it is just one, that’s fine, too, as long as I make progress. 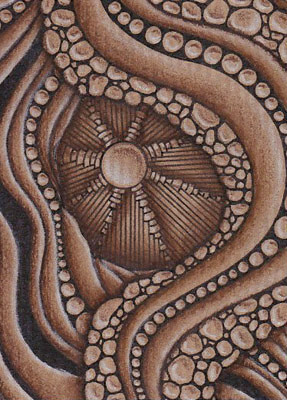 I’ll only use the tangles introduced in the book up to that point for a tile. To be able to stick to this rule, I’ll keep a list (not on the blog) I can refer to without having to flick through the book all the time. No day shall be skipped (even though I already know that the “white on black”-challenge will be very hard for me..) and no excuses are allowed here. 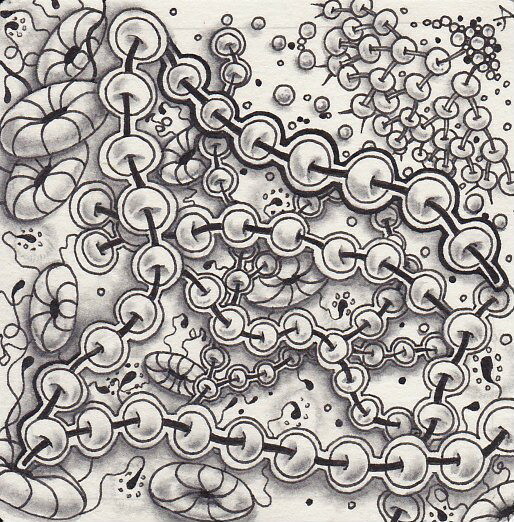 I really like the tangle connections here, especially how Hollibaugh keeps the whole thing together! Crescent Moon now looks like a tunnel Hollibaugh is crawling through. Overall I think that the effect is even stronger on the screen than on the tile, which is nice for a change. 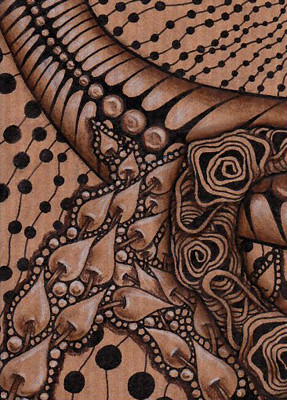 ^^ It is only Pokeroot that I’d really love to eradicate from this piece.. 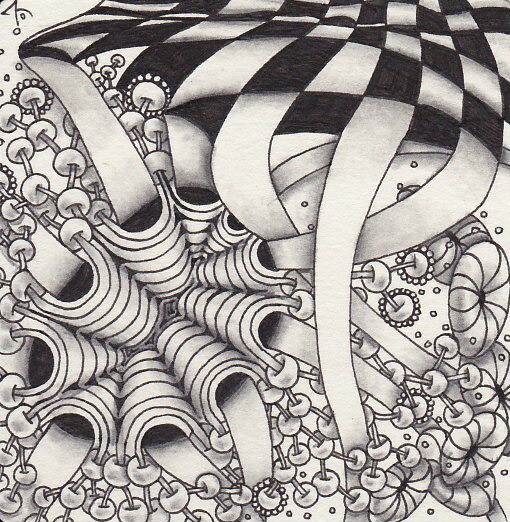 But of course I can’t and I wouldn’t do it because that’s Zentangle and because it is another good lesson for me to learn. See you soon for the next days and lessons to be learnt! Inktober was such fun! I really like drawing on a daily basis (for as long as I had the time) and simply loved to follow on Twitter what everyone else did for this wonderful challenge. Unfortunately, I only made it to day 17 of Inktober, I simply couldn’t keep it up any longer. However, this is a lot more than I thought I could do, so I’m still happy and I definitely want to try again next year! 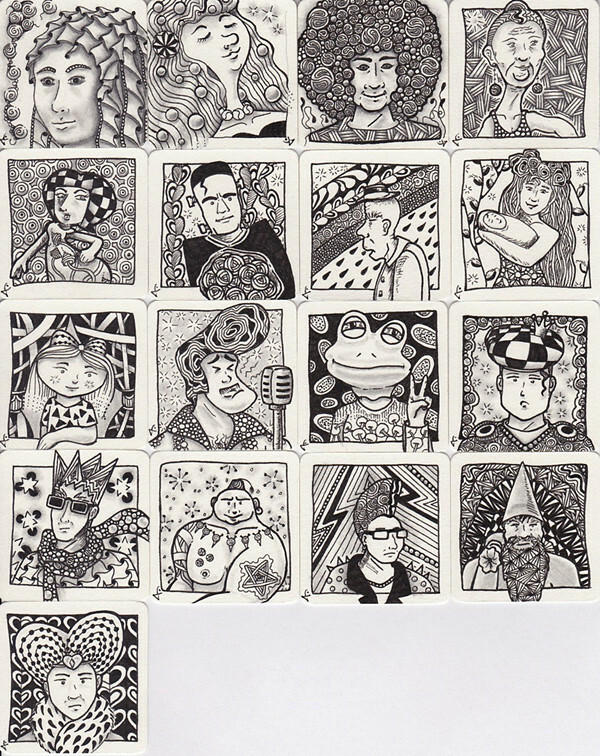 Here I have the overview on all the Bijou tiles with all the Zentangle-inspired drawings I did last month. Although it is strictly speaking only halfway done it’s still a great thing to look at! Which one is your favourite? I have so many favourites that it would be faster to tell you which ones I didn’t like. But I won’t do that. Inktober is not about critizising but about developing good habits and maybe even seeing some progress in your work. And I’m really satisfied with this last point!